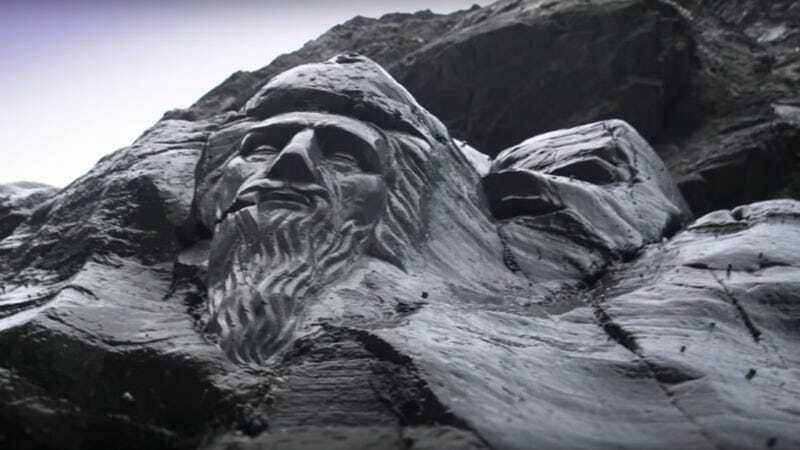 A campaign group called Kernow Matters to Us (Kernow is Cornwall in Cornish) expressed horror at the Merlin carving and the other planned works. In a statement it called the carving “desecration” and said the changes were all about drawing more fee-paying tourists to the site. “Would this be allowed at Stonehenge, or at Dover Castle? What about something engraved in the white cliffs of Dover?” the statement said. The group said it feared that Tintagel could end up like Land’s End – a “tacky tourist attraction”. The Guardian notes that there’s a certain amount of underlying Cornish frustration about the way Tintagel has been wrapped up with Englishness, as opposed to Cornishness, playing out here. Not that everybody’s mad: “Anything that brings in more visitors has to be good for the village,” concluded the owner of the nearby Cats Whiskers gift shop. When are they gonna add a larger-than-life bronze casting of shirtless Adrian Turner in character as Ross Poldark? That’s what I wanna know.